Where is Washington and why should you consider coming? Located in the northwest corner of the United States, Washington – the state, not the nation’s capital – is one of the most productive agricultural growing regions in the nation. Washington ranks number one nationally in eleven crops, including apples, cherries, and red raspberries, and second or third in eleven others. 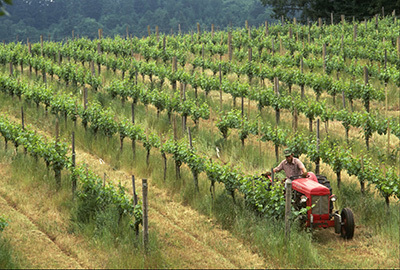 Most of Washington’s harvest activity occurs between late April and early November. Washington’s bountiful harvests are the product of a temperate climate, nutrient-rich volcanic soil, and irrigation water from the mighty Columbia and Snake Rivers. What is the state’s largest crop? Apples are Washington’s largest crop, by far. Washington is also the largest producer of apples in the nation. Nearly three out of every five apples in the U.S. are grown in Washington. Washington apples thrive in the warmer, more arid climate of central and eastern Washington. Apple harvesting begins in mid-August and generally ends in early November. Between 10-12 billion apples are handpicked in Washington each year. Every Washington apple is picked by hand. What is the state’s next largest crop? Washington is the nation’s largest producer of sweet cherries. More than half of the nation’s sweet cherries come from this state. Like apples, Washington cherries also thrive in the central and eastern parts of the state. Washington cherries are generally harvested between early June and the end of August. In addition to apples and cherries, Washington produces significant amounts of other tree fruits, including pears, peaches, apricots, nectarines, and plums. These are generally harvested between July and September, which puts them more or less between the more dominant cherry and apple harvests. These orchards are also mostly in the central and eastern regions of the state. Are there opportunities in western part of the state? Yes. Washington is the largest producer of red raspberries in the U.S. More than 90 percent of the nation’s red raspberries are grown in Washington. Red raspberries thrive in the relatively cool, marine climate across Western Washington, especially in the northwest part of the state. Washington’s red raspberries bear fruit twice a year: In late August through early September, then again the following June through July. Strawberries are another major crop in Western Washington with most of the harvest coming in June. For additional information about other crops in Washington, see the Activity Calendar.